Provide comfort for the family of Ariel Wood with a meaningful gesture of sympathy. Surrounded by the love of her family, Ariel Wood, passed away on Monday, January 28, 2019 at Seaforth Community Hospital. In her 96 years among us, Ariel was a source of love, caring and kindness within the circle of her family and friends. Ariel always enjoyed a rousing game of cards and cheering on her grandchildren at their sporting events. Ariel saw the world as a place to discover, traveling extensively over the years. 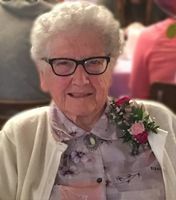 Ariel will be lovingly remembered by her children, Rick and Joan Wood of Seaforth, Ken Wood of Dawson Creek B.C., Sylvia Wood and Eugene Mountenay of Parkhill and Brenda Wood of London. Cherishing memories of a much loved grandma are grandchildren Pam and Brian Harper, Bev Wood and Lloyd Crich, Jill and Nick ten Hag, Scott and Amanda Wood, Dean and Carrie Wood, Scott Mountenay and Gabriela Reyes and great grandchildren Shaelynn, James, Stephanie and Dylan, Shawna and Kevin, Brandon and Becka, Benjamin, Jonathan, Spencer, Charlie, Payton, Phoebe, Abigail, Emma and Sofie and great, great grandson Beau. Ariel will be fondly remembered by her siblings and siblings-in-law Lois McMichael, June Robinson, Jim Johnston, Alice and Clarence Ritchie, Jack and Janet Johnston, and Annie Sallows along with many nieces, nephews and friends. In faith, we trust that Ariel’s spirit is now reunited in eternal life with her husband Charles (Chuck) Wood (1990) and their son Bill Wood (2015), her parents Gershom and Ella Johnston, parents-in-law Charles Wood and Charlotte Rabbits and siblings and siblings-in-law Billy Johnston, Elliott and Mary Johnston, Donelda and Stewart Smith, Ken and Donna Johnston, Ted Robinson, Idella Johnston, Mary Mennell and Don (Chip) and Ann Wood. Funeral arrangements are entrusted to McGlynn Family Funeral Home (519-527-1390), 87 Goderich Street West, Seaforth. A celebration of Ariel’s life will take place on Saturday, February 2nd from 1-3 p.m. at Seaforth Legion, Branch 156, 123 Main Street South, Seaforth. Interment will take place in Maitlandbank Cemetery in the spring. As expressions of sympathy, donations to Seaforth Community Hospital Foundation, Canadian Diabetes Association or the Canadian Cancer Society would be appreciated by the family. Family and Friends are invited to a come and go celebration of life service. A private family interment will take place in the spring. Consider providing a gift of comfort for the family of Ariel Wood by sending flowers. We encourage you to share your most beloved memories of Ariel here, so that the family and other loved ones can always see it. You can upload cherished photographs, or share your favorite stories, and can even comment on those shared by others. Sorry to hear of the loss of Ariel, she was such a GREAT person and had a wonderful personality She will be missed sadly!! She lives on in the wonderful memories in all your hearts.